The time came to re-read Snow Crash. I had first read Neal Stephenson’s seminal science fiction novel when it came out in 1992, and then again at the end of the millennium, which seemed appropriate. Now, to celebrate its 25th anniversary, it was time to listen to the audiobook version. By the way, although I love it, this is not my favorite Stephenson novel. That honor would probably go to the massive Cryptonomicon (1168 pages), or possibly Reamde (1055 pages), or maybe Anathem (1010 pages)… it’s so hard to pick! And Seveneves (a mere 880 pages) is also great, though not as good as the first four I mentioned. And then there are those novels that I haven’t even had time to read yet. 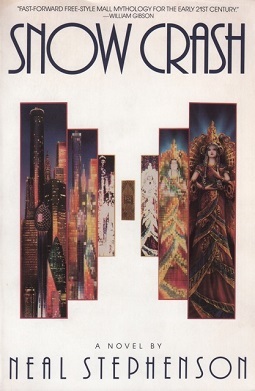 So Snow Crash (480 pages) isn’t my favorite, but it’s possibly the most important and influential. I couldn’t really summarize the book here even if I wanted to — and I don’t want to. You can find descriptions of it all over the Web, starting with the Wikipedia entry and branching out from there. Suffice it to say that we have a combination of a plausible and chaotic near-future United States with an updated and totally changed Internet (which was not quite yet well-known when the book was written). The new Internet, the Metaverse, is basically a form of virtual reality, a shared hallucination if you will, more like a massively multi-player online role-playing game, clearly the inspiration for Second Life (2003), World of Warcraft (2004), and so forth. But remember that Stephenson’s book came out back in 1992. Along the way, in Stephenson’s trademark style, we delve into history, linguistics, anthropology, archaeology, religion, computer science, politics, cryptography, memetics, and philosophy — a list I got from Wikipedia as I couldn’t have put it better myself. Despite all this, many of the characters are reasonably well-developed and three-dimensional. But this is not a mainstream novel that you read for character development and insight into the human condition; it’s a novel of ideas. (I’m sure there’s a German word for that — a single word of course — but I can’t think of it.) It’s also a satire of government and societal institutions in general. If you’ve never read it, do so, as long as you can put up with having a protagonist named Hiro Protagonist. A final word about the audiobook edition: The narrator, Jonathan Davis, is quite effective, especially at conveying different characters’ voices. The only downside is that the hero’s name sounds like Hero Protagonist — not that that’s exactly accidental.